It has never been more important to pay close attention to the state of the hire car before signing the checkout sheet and the beginning of your rental. Facing an increased competition and, sometimes, incredibly low profit margin, the rent-a-car operators are now, more than ever, watching for opportunities to increase their gains. Additional charges for unreported damage are more and more common amongst car rental customers who rushed through the pick-up procedure and did not take time to inspect their rental vehicle properly. Unless every dent, scratch or a missing part was taken note of at the beginning of the rental, after delivering the car they are likely to receive a, sometimes, hefty bill for damage they didn’t cause. 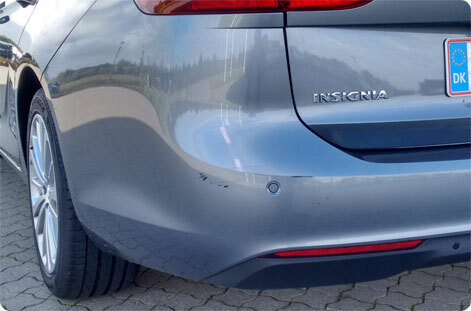 Check for scratches even on brand new cars. Our brand new Opel Insignia Tourer, rented from Europcar Denmark already came with one. © Foto: Lisbon-cheap-car-hire.co.uk. In the past, car rental companies would often overlook insignificant damage, focusing rather on retaining the customer than ‘pestering’ him with bills for minor repairs, which would, otherwise, be taken care of when de-fleeting. Nowadays, the struggle for increasing the profit forces rent-a-car agents to be more thorough in order to secure more extra income. In order to guarantee that you will not be made financially liable for the damage caused by someone else, make sure to check the state of the care thoroughly when taking delivery of it. Often, car rental customers are in a hurry to pick up their rental car and drive off to their final destination. Car collection can be an challenging experience after a tiring flights, with a long queue to the rent a car desk, and especially, when travelling with impatient young children. Even in such extreme conditions, do make time to have a good look at your rental vehicle before putting your name on the checkout sheet. By signing it, you assume responsibility for any damage existing at the time of returning the car. Have a good look at the car, from different angles, both on the inside and the outside and make sure that anything remotely resembling a damage has been noted on the checkout sheet. 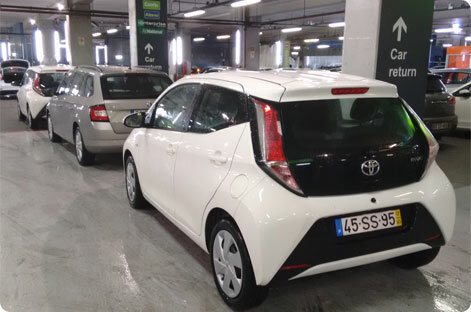 Out test rental Toyota Aygo was returned to Lisbon Airport without any complications. © Foto: Lisbon-cheap-car-hire.co.uk. Bad lighting may make it hard to notice some scratches. Many car rental companies park their fleet in underground parking lots; it may also happen that you will be picking your car up outdoors, at night. If you feel it is too dark to properly inspect the vehicle, make sure that a note about it was included in the check-out sheet. Also, refuse to accept a dirty car. Washing cars before the rentals is a common practice in most reputable car rental companies. Many light scratches can come unnoticed in a car covered in dust. An attempt to hand you a dirty car with an excuse of ‘We didn’t have time to wash it’ is a reason to raise a red flag. You will take hundreds of pictures during your holiday. Make sure to take a few pics of your rental car whenever there is anything that could be qualified as damage, especially if the company´s employee insists it is too irrelevant to be included in the checkout sheet. Your photo evidence may come in handy should the status of the ‘irrelevant’ damage change in the eye of the employee who will collect the car form you at the end of your rental. Damage to the interior of the car may be very expensive to fix. A few minutes to inspect the inside of your rental car is a time well spent. Pay special attention to any signs of smoking in the car. Virtually all rent a car companies forbid smoking in their cars, some being more restrictive about it than other, but you are likely to be charged heavily for it if cigarette burns, or smell, are found. Also, check for any missing elements, and, once inside, have a good look at the windscreens and other windows. Some stone chips or dents are best visible from the inside. If, for some reason, you failed to detect any existing damage during the checkout, you should still try to report it to your car rental agent, as soon as possible, after founding it. There isn’t any guarantee that the rent-a-car company will include it in the checkout sheet, but you boost your chances of having it corrected when you act quickly. Many car rental customers, especially in popular holiday destinations of southern Europe might have had a misfortune of being a part truly catastrophic scenarios, with long queues, crying children and angry, snappy adults on both sides of rent-a-car counters. Although high standards of customer service should be the norm regardless of the conditions in which the companies operate, it is easy to imagine that the pressure of a high season takes a toll not only on the customers but also on the employees of the often under-staffed car hire companies. 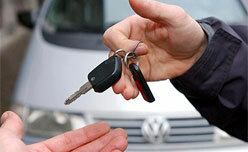 Be to the point but fair and polite when dealing with your car hire agent, also in case of a dispute. A polite attitude and a smile when defending your point of view may result in a much smoother car rental experience and, in some cases, even save you some money when a debatable damage case is being considered. Please feel free to comment Click here to cancel reply.